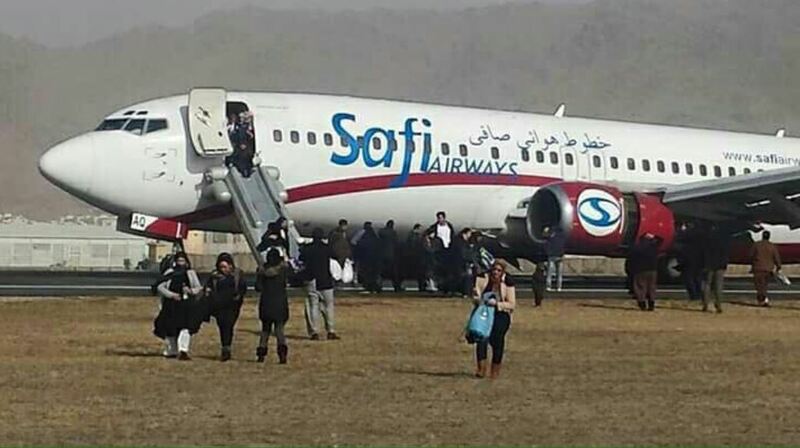 10 Dec 2016 - 737-400, JY-JAQ (27826/2694), FF 27/01/1995, operated by Safi Airways suffered a collapse of the right hand main landing gear at Kabul on runway 11 at 12:24L (08:24Z). The combination of a soft landing, at high speed and high airport elevation caused the torsion link of the shimmy damper remained in an extended vertical position and fail. The RH MLG collapsed causing the aircraft to skid and come to rest on the #2 engine. All 155 POB evacuated down the slides with no injuries. The operations of Safi Airways was suspended for a short time in September 2016 due to debts and taxes of AFN 1,152,774,691. According to a statement by Afghanistan Civil Aviation Authority, the decision to suspend the operations of the airline was taken by the Ministry of Finance of Afghanistan. Safi Airways is on the European Commission's airline blacklist, as part of a blanket ban on all Afghani carriers. However this aircraft was sub leased from from Jordan Aviation and was Jordanian-registered. On 10 December 2016, JAV Boeing 737-400 Aircraft, registration JY-JAQ, operating a leased scheduled passenger flight SFW 502, on behalf of SAFI Airways under wet lease contract with the later call sign, departed a domestic flight from Herat Airport (OAHR), at 07:00 Z from RWY 36 to Kabul International Airport (OAKB) Afghanistan. At approximately 07:57:45 Z, the Aircraft touched down RWY 29 at Kabul. The aircraft departed Herat with 164 passengers ,07 Operating Crewmembers and 02 Engineers , Total on board were 173 person. As the flight approached OAKB, the crew received the automatic terminal information service (ATIS) from OAKB station at 07:45 Z indicating normal weather with visibility of 6 Km, temperature 07 degrees Celsius and wind of 150/07. The Aircraft was configured for landing with the flaps set to 30, and approach speed selected of 152 knots (VREF + 10) indicated airspeed (IAS). The Aircraft was cleared to approach ILS 29. The Aircraft was vectored by the radar for RWY 29. Air traffic control cleared the flight to land, with the wind reported to be 190 degrees at 15 knots. The crew stated that a few seconds after the touchdown, they felt the aircraft vibrating, during which they applied brakes and deployed the reverse thrust. The vibration was followed by the aircraft rolling slightly low to the right. It later came to a full stop left of the runway centre line, resting on its left main landing gear and the right engine, with the nose landing gear in the air. The occurrence occurred at approximately 3,806 ft / 1,160 m past the threshold. The PIC declared Emergency to the ATC and the cockpit crew initiated an evacuation command from the left side of the aircraft. Evacuation was successfully accomplished with No reported injuries. Kabul airport RFF reached the occurrence aircraft and observed the smoke coming from right side and immediately deployed their procedures by spraying foam on engine # 2. The aircraft sustained substantial damage due to the separation of the right main gear resulting on the aircraft skidding on the right engine cowlings. No injuries were sustained by any of the occupants during the occurrence or the evacuation sequence. Operating crew of the incident flight were called by the Afghani Civil Aviation Authority (ACAA) for interview and medical examination (alcohol and drugs, blood test). The Aircraft sustained a substantial damage as it can be seen from the pictures, the actual damages and status of the aircraft will determined in the damage report, in addition to the pictures shown below the following estimation for the damage can be summarized with the following; Right Main Landing Gear was detached from its place; Right trailing inboard flap was detached due to the impact of separated parts of the landing gear. In the absence of the right MLG, the aircraft was skidding on its Engine # 2 hence an additional damage to the underside of the right engine nacelle occurred as it was sliding along the surface during the landing roll. The separation of the Right Main Landing Gear caused damages to the runway surface and might cause damages to runway lights. The captain of the occurrence flight has joined JAV on 01.10.2005, He started his type rating on B737 on 31.10.2005, he was cleared FO on 15.08.2007 with 250 hrs. His Command upgrade course was on 14.03.2015 ends 28.03.2015 with total of 3592 hrs On the B737. He started line training as PIC on 03.05.2015 and he was cleared on 21.05.2015 with 48.35 hrs. / 26 sectors. The point of touchdown of the Aircraft with the runway was approximately 1,067 meters from runway 29 threshold, approximately 240 meters before TWY M, the RWY approximate remaining distance was measured to be 2,351 meters from the point of touch down to the point at RWY 11 threshold. The Aircraft came to rest at 326 meters from runway 11 threshold. At touchdown, the right main landing gear suffered a damage that resulted with the detachment of the assembly. The aircraft slid on the right engine until it came to complete stop. As the right main landing gear detached from its position, the tyres and detached components resulted in damage to the fuselage and right inboard flaps, which was detached also as a result of the impact with parts of the landing gear assembly. The right engine suffered significant damage to impact with ground. The aircraft was removed from the runway to one of the adjacent aprons. The tyres suffered damage no several locations, the tires were showing damage on the side walls. The aircraft’s right-hand main landing gear inboard tire shaking tire marks occurred for a distance of approximately 400 - 500 m, at this time the right main landing gear had detached and was dragged away, causing the right wing to drop. There was evidence of runway surface damage at almost similar intervals of appearing together with the hard tire contact marks, and this may also indicate that both tires were damaged after the shimmy damper failed and the oscillations were occurring. No map diagram for the accident scene was performed by the Afghan Authority to show the wreckage distribution, and all damaged parts of the aircraft were collected and stored at the civil defense hangar. The FDR data show the airplane descending from 1000 feet radio altitude (RA) configured for a flaps 30 landing with the speedbrakes armed, the autopilot disengaged by time 3810 seconds, and the autothrottle engaged through touchdown (Figure 1). 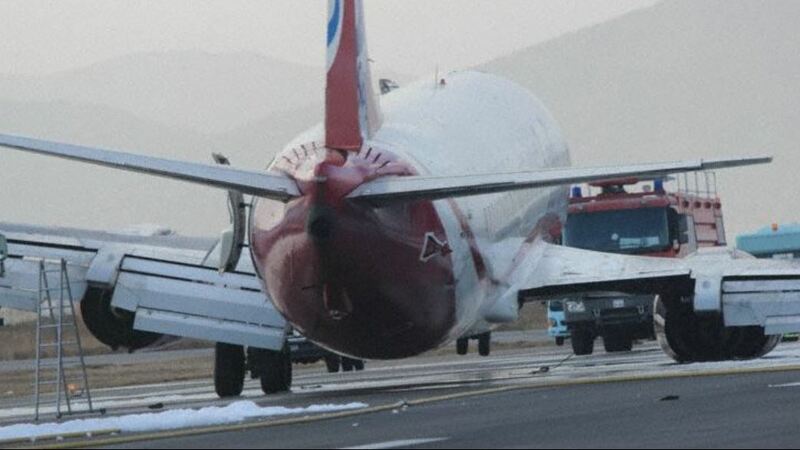 The airplane was on approach to Runway 29 at KBL (verified by the recorded magnetic heading) and landed at a gross weight of 123,100 pounds (LB) [the maximum design landing weight is 123,899 LB]. Based on the landing weight and flap position, the landing reference speed (VREF) should have been approximately 142 knots. The approach speed was not recorded; however the computed airspeed was maintained at approximately 162 knots during the final approach with the autothrottle engaged which indicates that the approach speed was most likely VREF+20. From 900 feet RA until 75 feet RA, the descent rate (negative calculated vertical speed) was maintained at above 1000 feet/minute (fpm) with an average descent rate of 1250 fpm and maximum descent rate of 1400 fpm at time 3828 seconds. The glideslope deviation indicated the airplane was below the beam during the approach and the localizer deviation indicated that the airplane was either on or slightly right of the runway centerline (Figures 1 and 2). The calculated wind data were comparable to the airplane recorded ship system winds in magnitude, with more variation in the direction (Figure 2). However, both wind data sources indicate that the airplane was in a left quartering tailwind. Beginning at about time 3740 seconds at approximately 2000 feet RA, just as the airplane descended to capture the glideslope (not shown), the atmospheric conditions became turbulent with increased perturbations in computed airspeed, vane angle of attack, normal load factor and lateral acceleration, along with increased control wheel and column inputs to maintain the desired attitudes. During the approach, the airplane experienced an average 7-knot tailwind with an approximate 15-knot left crosswind component. At about 35 feet radio altitude, an airplane nose-up column input was commanded around time 3851 seconds initiating landing flare, and the sink rate began to decrease (Figure 3). The airplane was in a left crab (negative drift angle) which is consistent with a left crosswind, which was nearly removed at touchdown with right rudder pedal input (Figure 4). Based on a change in character of the longitudinal acceleration, the main gear contacted the runway at time 3862 seconds at a computed airspeed of approximately 158 knots (VREF+16) and a ground speed of 178 knots (Figure 3). The main gear air/ground discrete parameter changed state from AIR to GROUND just after time 3863 seconds. The descent rate at the center of gravity (CG) when the main gear transitioned to GROUND state was 3.0 feet/second (fps). Touchdown occurred at a pitch attitude of approximately 0.4 degrees nose-up and a bank angle of approximately 1 degree to the right (Figures 3 and 4). The closure rate (negative calculated vertical speed) of the right main gear was also calculated which takes into account the runway slope and Euler angle rates; however the slope of the runway was unknown and therefore was not included in the closure rate calculation. At touchdown, the Euler angle rates were negligible (not shown) which resulted in a right main gear closure rate that was very similar to the descent rate at the CG of 3.0 fps (Figure 3). Following the initial main gear ground contact, the speedbrakes deployed at about time 3862 seconds and approximately 1 second later the throttle levers began to transition to the reverse idle detent (Figure 3). At time 3865 seconds, large spikes in all three acceleration parameters were observed (Figures 3 and 4). These large spikes corresponded with the initiation of a bank angle change from 1 degree to 6 degrees to the right, the main gear discrete momentary transition to AIR for 1 second, and the nose gear discrete transition to GROUND for 1 data point. As the bank angle increased to the right, a left control wheel input was commanded to 35 degrees (Figure 4). A second set of smaller spikes in the acceleration data occurred just after time 3866 seconds as the bank angle reached 6 degrees and nose gear discrete transitioned to AIR [Figures 3 and 4]. The airplane came to rest at approximately time 3906 seconds while closely maintaining the runway heading (not shown). Between the initial main gear ground contact and the air/ground discrete transition to GROUND, the normal load factor, longitudinal acceleration, and lateral acceleration began to fluctuate until approximately time 3865 seconds when the large spikes in the accelerations were observed (Figures 3 and 4). In addition, the fluctuations in the lateral acceleration increased in magnitude during this time (Figure 4). Due to the report in the SR that the right main gear departed the airplane during the landing rollout, it was deduced that the first set of large acceleration spikes most likely corresponded to the loss of the right main gear. This is also the time that the bank angle began to increase to the right. The second set of acceleration spikes most likely corresponded to the airplane settling onto the right engine nacelle after banking to the right as a result of the loss of the right main gear. The airplane completed the landing rollout balanced on the left main gear and the right nacelle with a pitch attitude of approximately 2 to 3.6 degrees nose-up and bank angle of approximately 6 degrees to the right (Figures 3 and 4). Additional damage to the right wing control surfaces can been observed in the right aileron deflection. The deflection limits of the ailerons is +/-20 degrees. After the right main gear collapse at time 3865 seconds, the right aileron deflection increased to +/-40 degrees, whereas the left aileron deflection remained in the expected range (Figure 4). A ground track was generated to show the airplane’s path during the approach and landing rollout (Figure 5). Runway 29 at KBL has a length of 11,520 feet and a width of 140 feet. Longitudinal and lateral distances were calculated using a combination of inertial data (ground speed, drift angle, heading), glideslope/localizer deviation, and airport information (runway dimensions, taxiway dimensions, etc.). The airplane’s actual final resting position was not provided. The distances shown in Figure 5 were calculated based on the analysis of the recorded FDR data without reference to a physical anchor position. If the final resting position is provided (latitude/longitude or runway distances), the calculated ground track can be adjusted. The calculated airplane path is referenced to the airplane CG. The ground track analysis results indicate that the airplane crossed over the runway threshold at 40 feet radio altitude and flare was initiated immediately after. Initial main gear contact occurred 3500 feet beyond the threshold as evidenced by the decrease in longitudinal acceleration and the speedbrake handle deployed soon after. The main gear air/ground discrete transitioned to GROUND at 3750 feet beyond the threshold. Large spikes in all three acceleration parameters occurred at 4350 feet beyond the threshold, which most likely correlates with the loss of the right main gear, followed by the bank angle increasing to the right with control wheel commanded to the left. The main gear discrete temporarily transitioned to AIR after the first set of acceleration spikes and the nose gear discrete transitioned to GROUND for 1 data point. At 4700 feet beyond the threshold, a second set of spikes was observed in the acceleration parameters just as the bank angle neared its maximum value of 6 degrees to the right, which most likely correlates to the airplane settling onto the right engine nacelle. At this point, the nose gear discrete transitioned back to AIR and the main gear discrete transitioned back to GROUND. The remainder of the landing rollout was performed on the left main gear and right engine nacelle, with the airplane pitch attitude between 2 and 3.6 degrees nose-up and the bank angle at approximately 6 degrees to the right. The estimated final stopping location of the airplane was 10,450 feet beyond the runway threshold and 20 feet to the left of the runway centerline. Load sheet Information: - MTOW : 60 000 KG. - ATOW : 58 467 KG. with under weight of 1533 KG. This extra fuel load resulted in a higher final approach VREF and Touch Down Speeds. ATC reported landing wind (CVR) on R/W 29 wind 190/15 KTS on landing clearance will result in a tail wind component of 1 KTS tail wind and 15 KTS Cross wind. Jeppessen Chart ILS R/W 29 indicate a 3.50 Degrees angle which will result on a higher sink rate than normal approaches on different R/Ws. All the above mentioned factors will result in higher ground speed and can effect in unstabilized approach which clearly indicated by (SINK RATE) EGPWS warning triggered bellow 300 Feet AGL and the commander gave the call to continue the landing and the F/O PF corrected for the sink rate and continued the landing resulting in floating for approximately 4 seconds and touchdown longer than normal landing. Jordan Aviation is exercising different operations on wet lease bases on behalf of foreign operators and sometimes it operates to airports that requires specific crew and pilot training as they may have unusual and often difficult approaches . Jordan aviation have no evidence that Kabul airport has been categorized or a training for the crew in SAFI operation has been made for this airport. Jordan Aviation operation supervision need to create qualification requirement for certain route and airports were scheduling should account for level of experience requirements for certain flights and airports and should specify PIC landings in certain runways and conditions, like the situation in hand (High Elevation, Higher than normal glide slope angle, Tail wind Close to the limit) situation indicate a PIC landing is more likely. When Asked about the high fuel weight (5200 KG Fuel onboard) the PIC replied that Kabul is famous for drastic weather change and his alternate was the departure airfield. Flight Duty and Rest Limitation was not considered a factor contributing to this occurrence. Crew Qualification and Standard Operations Procedures (SOP). a. Jordan Aviation need to qualify and address steep approaches operation in their Operations Manuals and accommodate the required training in JAV Training Policy. b. Training was done on time and no reported deficiencies. But the training does not accommodate for the irregularity of operations and does include unstable approach recognition. • Sink rate is no greater than 1000 fpm. Throughout the approach, there were several sink rate exceedance of 1000 fpm. The CVR data show that a “Sink Rate” warning was triggered for 2 seconds between 159 - 115ft AAL. The average Vertical speed during the warning was -1093 ft/min. This rate of descent warnings is normal on approach to a high altitude airport with a steep (3.5 degree glideslope) due to the higher True Airspeed and consequent higher Groundspeed. The rate of descent required to maintain a 3.5 degree glideslope with a Groundspeed of 180Kts is 1064ft/min. • The flight crew selected an approach speed of Vapp+10, while the ATC a wind of 140/07 which indicates a tailwind component of 6 knots, the crew should select Vapp+5 at that stage. Although they were selecting Vapp+10, the FDR data was showing an average of 165-170 knots IAS which is 15 – 18 knots higher than the selected approach speed, and that speed deviation continued until the aircraft reached the flare height were the trends went down towards a speed of Vapp+5. The Flight Crew Training Manual also contains the following recommendations that are applicable to this event: Initiate the flare when the main gear is approximately 20 feet above the runway by increasing pitch attitude approximately 2° - 3°. This slows the rate of descent. After the flare is initiated, smoothly retard the thrust levers to idle, and make small pitch attitude adjustments to maintain the desired descent rate to the runway. A smooth thrust reduction to idle also assists in controlling the natural nose-down pitch change associated with thrust reduction. Hold sufficient back pressure on the control column to keep the pitch attitude constant. Ideally, main gear touchdown should occur simultaneously with thrust levers reaching idle. Do not allow the airplane to float or attempt to hold it off. Fly the airplane onto the runway at the desired touchdown point and at the desired airspeed. Prolonged flare increases airplane pitch attitude 2° to 3°. When prolonged flare is coupled with a misjudged height above the runway, a tail strike is possible. Do not prolong the flare in an attempt to achieve a perfectly smooth touchdown. A smooth touchdown is not the criterion for a safe landing. The flare followed with aircraft floating action above the runway for a distance of 1,067 m from runway threshold was only justified with pilots’ judgment to bleed the energy of the aircraft before touchdown to avoid a hard landing. The flight crew stated that this kind of techniques is always used in high altitude airports to avoid high energy touchdown keeping into account the remaining runway distance to stop the aircraft on the landing run. The characteristics of the landing are consistent with past landing gear shimmy events. The airplane touched down at a high ground speed and low sink rate, and the air/ground discrete transition to GROUND occurred approximately 1 to 1.5 seconds after initial main gear ground contact, indicating that the struts were extended for that period of time. As a result, the torsion links of the shimmy damper remained in an extended, vertical position, where the damper has less mechanical advantage for longer periods of time. Despite the presence of shimmy damper hardware, which is designed to reduce the torsional vibration energy generated during landing, airplanes occasionally experience main landing gear shimmy. As a result, the torsion links of the shimmy damper remained in an extended, vertical position, where the damper has less mechanical advantage for longer periods of time. “Based on operator reports, MLG shimmy is an infrequent event that is characterized by strong vibration, usually from one MLG, that begins at touchdown and continues until the airplane is fully stopped. Historically, there have been two or three shimmy events a year in the worldwide 737-200/ -300/-400/-500 fleet. However, in the last few years, the rate of shimmy events has increased sharply on these models. In a few particularly severe shimmy events, the affected main landing gear collapsed during the landing. This article discusses causes of shimmy and recommended actions operators can take to reduce the likelihood of it occurring. Boeing sometimes receives reports from operators of what is assumed to be a hard landing because of the violent nature of the landing and the observation of a torsion link fracture. Due to the geometry of the torsion links, the shimmy damper is most effective when the landing gear strut is compressed in the ground mode. Lower touchdown descent rates increase the likelihood of a shimmy damper failure. It is important to note, however, that proper maintenance of the gear components is the best way to prevent shimmy damper failures. The possibility of landing gear shimmy events is greater at high altitude airports. For shimmy to occur, the landing gear must have a force applied to it that excites this torsional vibration mode. The 737 has a vibration frequency of approximately 15 Hertz (Hz). Boeing engineers theorize that the force needed to initiate shimmy is probably an alternating drag force, such as if one tire touches down, causing a twisting motion of the inner cylinder in one direction and the second tire touches down a fraction of a second later, causing the inner cylinder to twist in the opposite direction. If the timing between the first tire and second tire contacting the runway is similar to the shimmy frequency, the gear can oscillate in the shimmy mode. Boeing also recommends that pilots strive for a landing with normal sink rates with particular emphasis on ensuring that the auto speedbrakes are armed and deploy promptly at touchdown. An overly soft landing, or a landing in which the speedbrakes do not promptly deploy, allows the landing gears to remain in the air mode longer, which makes them more vulnerable to shimmy. This is especially true when landing at airports located at higher elevations, where the touchdown speed is increased. Boeing has stated that a high-speed soft landing can contribute to excessive main gear shimmy or vibration in the 737-400 airplanes. 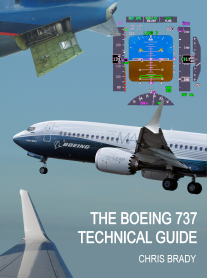 This is detailed in Flight Operations Tech Bulletin (FTOB) 737-15 released December 14, 2015 which states “Based on analysis of main gear shimmy events, low sink rate landings of less than 1 ft/sec (60 feet/minute) can increase the possibility of inducing main gear shimmy”. The conditions at actual touchdown and whether the gear can handle these conditions are questionable. Boeing agrees that a high-speed soft landing can cause the excessive shimmy with resultant failure. But, nowhere does Boeing state what the actual limitations are in terms of the limiting groundspeed and or touch-down vertical forces which are usually measured in g. This aircraft did a flap 30 landing, while Boeing allows flap 15 landings and even flapless landings, which will result in much higher landing speeds than were recorded in this case, but nowhere in the Operations Manuals does Boeing state that pilots need to beware of shimmy conditions at high speed and with soft landings and that this can cause a failure of the gear. This was explained by Boeing as they do not provide limitations to pilots on this circumstances since maintenance, tire wear, runway conditions landing speed and firmness of landing can all contribute to some varying degree. Additionally; Boeing do not as a normal course of action provide consequences in the Operations Manual. For SAW 502 Flight; a steep approach requirements for Kabul airport which has a 3.5 degrees glide slope profile and the high approach speed, while landing at a high altitude airport, resulted in excessive ground speed (165 - 170 knots) before touchdown. An extended flare that was the result of pilot judgment to bleed the aircraft energy to avoid a hard landing led to touchdown at a low sink rate (58 feet/minute).  Excessive wear or freeplay in the joint where the shimmy damper connects to the lower torsion link (referred to as the apex joint). Wear at this location allows undamped torsional freeplay to exist in the landing gear at the apex joint, which greatly increases the likelihood of shimmy.  Wear or freeplay in the torsion link bushings (e.g., where the torsion links connect to the outer and inner cylinder). Wear at these locations also allows undamped torsional freeplay.  Landing with extremely low sink rates. This type of landing is more likely to experience shimmy than a firmer landing because the torsion links remain in an extended, vertical position where the damper has less mechanical advantage for longer periods to time.  Air in the damper. Several shimmy events occurred within a few flights after a new or overhauled damper was installed. In these cases, it is suspected that a thorough bleeding of air from the damper was not performed, thus preventing proper damper operation.  Damper piston fracture. In a small number of events, it is suspected that the damper piston fractured due to a preexisting fault (e.g., a fatigue crack).  Overserviced shock strut. In several events, an overserviced shock strut has been suspected to have been a contributing factor. A shock strut overserviced with nitrogen allows the torsion links to have a reduced mechanical advantage to react to the torsional motion of the inner cylinder.  Incorrect damper installation. In one event, a damper designed for a very early 737-200 had inadvertently been installed on a later airplane that required a more heavy-duty damper.  Unconnected hydraulic tube. In one event, a hydraulic tube for the damper was inadvertently left unconnected after unrelated maintenance, so there was no hydraulic fluid available to the damper. The aircraft had 16 open deferred defects at the time of the occurrence, nothing related to the landing gear. It was noted that a suspected hard landing was reported on 13/11/2016 at Kabul (KBL) and the aircraft was inspected I.A.W AMM 05-51-51showing no damage on the aircraft, technical log sheet no. 22318. It was noted that all landing gear shock struts were serviced I.A.W AMM 12-15-31 and AMM 12-15-41 with dry nitrogen on 30/06/2016, based on an open defect as per inspection discrepancy sheet no. 7151, the latter corrective action was followed up on the deferred defect sheet no. 3038 dated 30/06/2016, in order to check the X-dimension of all landing gear shock struts after 5 to ten landings, and this deferred defect was closed by the satisfactory check of the X-dimension of all landing gear shock struts with no further defects on 06/07/2016. 3.1.1. The pilots held valid licenses and medical certificates. 3.1.2. The aircraft had a valid Certificate of Airworthiness (C of A) and Certificate of Registration (C of R ) and was operated within the weight and balance envelop. 3.1.3 There were no reports of aircraft system abnormalities during flight. 3.1.4. The torsion link and shimmy damper of the right Main Landing Gear (MLG) assembly found broken. 3.1.5. Oscillating tire marks left on the runway. 3.1.6. The aircraft gross landing weight was 123.100 pounds LB, ( the maximum design landing weight is 123.899 LB ). 3.1.7. Based on the Landing weight and flap position , the landing reference speed (VREF) should have been approximately 142 knots. 3.1.8. During the approach the airplane experienced an average of 7-knots tailwind with an approximate 15-knots left crosswind component. 3.1.9. The main Landing Gear (MLG) contacted the runway at a computed airspeed of approximately 158 knots ( VREF+16) and ground speed 178 knots. 3.1.10. The speedbrake deployed immediately after the airplane touched down at 3500 feet beyond the threshold. 3.1.11. The airplane touched down at a high ground speed and low sink rate. 3.1.12. The lateral acceleration starts to fluctuate and grown until gear collapse. 3.1.13. A “Sink Rate” was triggered by EGPWS warning for 2 seconds between 159 - 115ft AAL. The average Vertical speed during the warning was -1093 ft/min. 3.1.14. The flight crew selected an approach speed of Vapp+10, while the ATC a wind of 190/15 which indicates a tailwind component of 1 knots, the crew should select Vapp+5 at that stage. 3.1.15. The PIC declared Emergency to the ATC and the cockpit crew initiated an evacuation command from the left side of the aircraft. Evacuation was successfully accomplished with No reported injuries. 3.1.17. Extra fuel load resulted in a higher final approach VREF and Touch Down Speeds. 3.1.18. ATC reported landing wind (CVR) on R/W 29 wind 190/15 Knots on landing clearance will result in a tail wind component of 1 Knots tail wind and 15 Knots Cross wind. 3.1.19. Jeppessen Chart ILS R/W 29 indicate a 3.50 Degrees angle which will result on a higher sink rate than normal approaches on different R/Ws. 3.1.20. Nowhere in the Operations Manuals does Boeing state that pilots need to beware of shimmy conditions at high speed and with soft landings and that this can cause a failure of the gear. 3.1.21. Jordan Aviation Operation depend very much on lease out to foreign operators and sometimes to use strange airfields operation. Jordan aviation training policy does not account for Route and Airfield competency. The Investigation committee determines that the airplane occasionally experienced main landing gear shimmy and the most probable cause indicated that the struts were extended for long period of time. As a result, the torsion link of the shimmy damper remained in an extended vertical position, where the damper has less mechanical advantage for longer periods of time. Despite the presence of shimmy damper hardware which is designed to reduce the torsional vibration energy generated during landing. The CARC has published the following Safety Recommendation in reference letter 31/100/508/15 on preventing MLG shimmy events to Jordanian operators that operate the Boeing B737-300/400/500 aircraft. The letter uses references from Boeing to describe MLG shimmy and give both maintenance and operational recommended operator actions. "Boeing also recommends that pilots strive for a landing with normal sink rates with particular emphasis on ensuring that the auto speedbrakes are armed and deploy promptly at touchdown. An overly soft landing, or a landing in which the speedbrakes do not promptly deploy, allows the landing gears to remain in the air mode longer, which makes them more vulnerable to shimmy. This is especially true when landing at airports located at higher elevations, where the touchdown speed is increased." In addition pilots are kindly requested to report any event of MLG shimmy or vibration to aircraft during landing or takeoff. The full final report can be read here.